Replacement 12T sprocket and disc set found on 1 spd Brompton bikes with Brompton's own freewheel hubs. Is this the smallest rear sprocket you can fit onto a 1 or 2 speed 2018 Brompton (Brompton 12T rear sprocket)? Also can a 2 speed Brompton have a 12T and 13T sprockets on the rear and a 56T chainring on the front? Yes, 12T is the smallest. Yes you could have 12/13, yes 56t would be suitable. 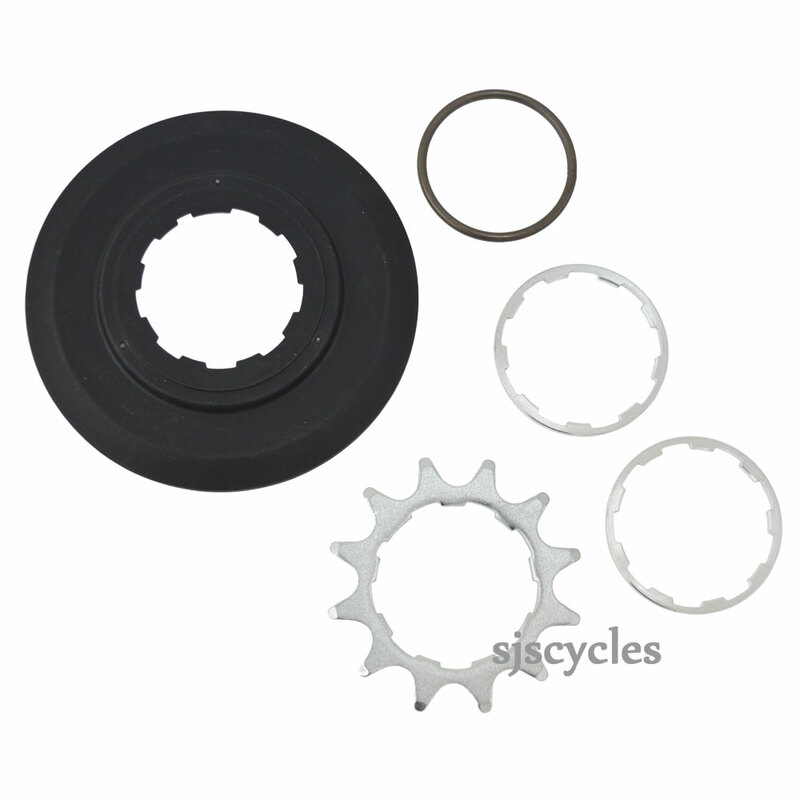 Do you supply sprocket spacers seperately? Yes we do. These can be found under part #34730. Can I use this to convert my 2 speed Brompton to a Single speed? Do I need to purchase an other parts? Chain - if yours is more than 1/2 worn. Chain tensioner - if you want the stock set up, the 2/6 speed one will work fine, but the SS bikes come with the 1/3 speed tensioner. Hi. Can I have this install on my 6speed bwr hub? Yes, but you will then only have 3 gears! Possible to fit 12T on my 2017 3-speed Brompton? Hi. I have your excellent SJSC Brompton 3 Speed Super Light Wheel Set fitted on my 2017 3 speed Brompton with I believe, a 13T rear sprocket & a 54T front sprocket. Will this 12T rear sprocket fit or do you have aftermarket lightweight sprocket available? Unfortunately this sprocket uses a different fitting to the one on your hub and due to the fitting on your hub the smallest sprocket you can actually fit is a 13T, so you can't fit a 12T at all.